Had / Hadit Hadit, 'the great god, the lord of the sky', is depicted on the Stèle of Revealing (also called Stèle 666 after its exhibit number, which was discovered by Aleister Crowley and his wife Rose in the Boulaq Museum in Cairo, Egypt in 1904), in the form of the winged disk of the Sun. Hadit is the principal speaker in the second chapter of Crowley's Book of the Law, where he identifies himself as 'the point in the centre of the circle', representing an infinitesimal point in space, and the human soul hidden therein. Hadit, the complement of Nuit, is related to the winged kneph, or Iao, an Egyptian emblem used in Masonic Rites. Notice that HAD, the root of Hadit, is comprised of the three central letters in abraHADabra. Haggadah A legend, parable, or anecdote used to illustrate a point of the Law in the Talmud. The non-legal, narrative element of the Talmud. Har-Paar-Kraat The Egyptian God of Silence, the youngest form of Horus called the Child Horus. He is depicted as a young boy seated or standing on a lotus flower with the tip of his index finger upon his lips. See also Harpocrates below. Harpocrates In Greek mythology, Harpocrates is the god of silence, adapted from the Egyptian child god Horus, and along with Ra-Hoor-Khuit is one of the twin aspects of Horus. Hasidism The Hasidic movement, a revolt against rabbinism and its accent on Talmudic accomplishment, was founded by Israel Baal Shem Tov (1698 or 1700 - 1760). It particularly stresses good deeds and piety through the joy of worship, songs, legends and dance, and had a wide appeal to the masses and its followers who were, and still are, called Hasidim. Hathor A complex Egyptian Goddess related to fertility, music, pleasure, love, and divine kingship. Her on as the celestial cow which encircles the sky and hawk god, Horus. She is referred to as Ahathoor in an adoration to Ra-Hoor-Khuit in the Book of the Law, Chapter 3:38. He The fifth letter of the Sacred Alphabet. It literally means window, has the phonetic value of H, and has a numerical value of 5. It is further attributed to the Zodiacal sign Aries and the Tarot Trump The Emperor. Heathen The word Heathen derives from a Gothic word meaning ‘person of the Heath’ or ‘dwelling in the Heath’ and is similar to the Latin word paganus from which we get the word ‘Pagan’. It evolved to refer to anyone who had not been converted to Christianity and was often used as an insult to mean that someone is barbarous, uncivilised and undisciplined and is often used as a synonym for Pagan as both words have been used in translations of the Bible in place of the word ‘Gentile’. Hermes Trismegistus The central figure of the mystical tradition known as Hermeticism, as portrayed in the literature known as the Hermetica. Hermes Trismegistus (Hermes thrice great) is a combination of Hermes, Mercury, and Thoth, who became credited by the ancient Egyptians as the inventor of writing. At one time Hermes was esteemed as a prophet to the Gentiles and was considered as important theologically as Moses. Many cathedrals throughout Europe bear his image to this day. Hermeticism Hermes Trismegistus could be considered to be the father of Hermeticism, a set of philosophical and religious beliefs. These beliefs have also had an impact on traditions of magick, but whatever their impact, they nevertheless arose from teachings and books accredited to Hermes Trismegistus. Heru-Ra-Ha Heru-Ra-Ha is a composite deity within Thelema composed of Ra-Hoor-Khuit and Hoor-Paar-Kraat. He is associated with the other two major Thelemic deities found in The Book of the Law, Nuit and Hadit, who are also godforms related to ancient Egyptian mythology. Their images link Nuit and Hadit to the established Egyptian deities Nut and Hor-Bhdt (Horus of Edfu). Hexagram A hexagram, a six pointed star composed of two overlapping triangles used by a number of faiths and cultures, is one of the oldest and most universal spiritual symbols. It is associated with the biblical King Solomon, and known as the Star of David in the Jewish religion. In Ritual Magick it is called the Seal of Solomon, and represents Divine Union, being composed of a female, watery triangle, and a male, fiery triangle. phobia The fear of the number 666. While the origin of the word may be Greek, the phobia itself comes from the Bible verse (Revelation 13:18), in which the number 666 is told to be the number of the Beast (Satan). Hierophant In ancient mystery cults, the Hierophant is an initiator, who possesses wisdom, i.e. occult knowledge. The word stems from the Greek, hieros (holy) and phanen (light) - revealer of the sacred. Nowadays, the term is used with the same meaning, but to denote an initiator in a number of magical traditions. The Hierophant is also the fifth card in the Tarot. Hod Hod is the eighth Sphere (Sephirah) of divine emanation according to Kabbalah. The word Hod means splendour. See also The Sephiroth. Holy Grail Christian Mythology tells us the Holy Grail was the actual dish, plate, or cup used by Jesus at the Last Supper, and that it possesses miraculous powers. Joseph of Arimathea is connected to the Grail through a book written in the 12th century. In this book he is supposed to have received the Holy Grail from an apparition of Jesus and sent it to Great Britain with his followers. Later writers, expanding on this theme, tell how Joseph used the Grail to catch the blood of Christ while interring him, and that he founded a line of guardians to keep it safe in Britain - many books and films have been written and made around this legend. The Holy Grail should not be confused with the Holy Chalice, which, in Christian tradition, is the vessel which Jesus used to serve the wine at the Last Supper. Holy Guardian Angel This term comes from the fourteenth century grimoire The Sacred Magick of Abramelin the Mage, and is most commonly employed in Thelemic Ritual, where it is considered the ultimate goal of all operations. In Ceremonial/Ritual Magick, the Holy Guardian Angel represents one's divine self. Holy Oil A magical weapon is any instrument used to bring about intentional change. In practice, magical weapons are usually specific, consecrated items used within ceremonial ritual. There is no hard and fast rule for what constitutes or does not constitute a magical weapon. If a magician considers it to be a weapon, then a weapon it is. However, there does exist a set of magical weapons with particular uses and symbolic meanings. Some such common weapons/tools include the dagger/sword, wand/baton, cup/chalice, pentacle/disk, holy oil, lamp and bell. See Magical Weapons and Oil of Abramelin. Hoodoo A type of folk magic drawn from Voodoo practices and related traditions, and found in Southern USA. The term Voodoo is applied to the branches of the West African Fon-Ewe people of Benin (formerly the Kingdom of Dahomey), where Vodun (Voodoo) is now the national religion of more than seven million people. The word Vodun translates into spirit. Since crossing on slave ships from Dahomey to Cuba and Brazil, we now find 'Voodoo' or 'Vadium' in Haiti, and Hoodoo in Mississippi and New Orleans. Horned God Sign The Horned God sign is deemed to represent the horned god of witchcraft, Pan, and other mythological nature gods such as Cernunnos. It has been used prolifically in public by Presidents Bill Clinton and George Bush Jnr. (and his wife Laura), as well as many other notable figures. Note that in this sign the thumb is placed under the middle two fingers, and should always be given by the right hand. The Horned God is typically associated with woods, wild animals, and hunting, as well as sexuality, especially male virility. Horned Hand Sign The Horned Hand (similar to the Horned God above) is a sign of recognition between those versed in the occult. When pointed at someone it is intended to place a curse upon him/her. Note that in this instance the thumb is placed over the middle two fingers and the sign is given by the left hand. In other circles, whether given as a hand gesture or worn as an amulet, it is supposed to ward off evil, in particular, the evil eye. Horus The son of Osiris and Isis, he was the sky god of Ancient Egypt. This lord of the heavens was depicted as a man with a falcon's head. 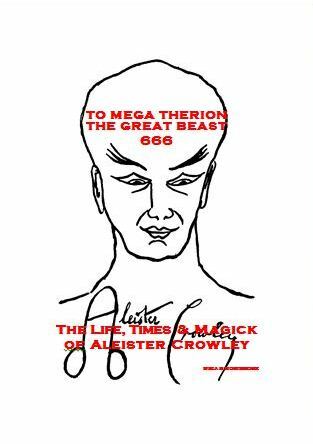 When Aleister Crowley received the Book of the Law from Aiwass in 1904, it brought the Aeon of Osiris to and end and ushered in the Aeon of Horus. Hrumachis The Egyptian double-lion form of Horus - the dawning sun. Hypnosis / Hypnotism Hypnotism is used to induce an altered state of consciousness in a person (the subject), during which suggestions can be made directly to that person's unconscious mind. It can involve a combination of relaxation, visualisation and repetition exercises, besides a number of other techniques. There is an increasing acceptance that the various magical states of consciousness (such as astral projection) can be achieved by self-hypnosis. Hypnotist One who practices Hypnotism.